Unless you’ve been hiding under a rock, you know that the already-celebrated film Hidden Figures is coming to a theater near you as it reaches its nationwide release Friday. Based on a book by the same name, Hidden Figures is a historical drama set in 1960s Hampton, Va., that chronicles the personal and professional lives of three African-American female mathematicians who defied the odds and overcame many societal obstacles to help NASA put an astronaut into orbit around the Earth. Deemed an important film by critics and audiences because it brings the largely untold story of three dynamic black female scientists to the big screen, Hidden Figures is also well done from a stylistic and narrative perspective. By keeping the stories of the black female leads primary, the film sidesteps the Hollywood trope of privileging the white character's story in order to satisfy white audiences. 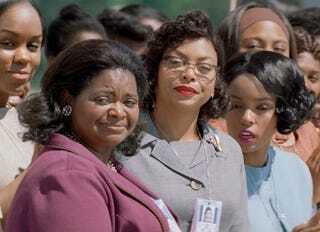 Although the white characters are important, they do not overshadow or diminish the importance of the stories of Katherine Johnson (played by Taraji P. Henson), Mary Jackson (Janelle Monáe) and Dorothy Vaughan (Octavia Spencer). Hidden Figures has also received a major advertising push from 20th Century Fox, which is unusual in Hollywood for a film with three black female leads. Historically black organizations have made viewing the film a social and civic occasion, with sororities, fraternities and the like sponsoring screenings in cities across the nation. Fox has also sponsored screenings for high school students in New York City and Los Angeles. It’s clear that there’s a movement to make Hidden Figures more than a film, but does it deliver? In a nutshell, yes. Directed by Theodore Melfi, who also co-wrote the screenplay, Hidden Figures documents the pervasiveness of institutional racism and how the mistreatment of targeted groups becomes normalized. The irony of an organization like NASA, which is committed to pushing boundaries and literally exploring the universe, limiting the career trajectories of women in general and black women in this story is preposterous. Melfi does a solid job of showing the absurdity of Jim Crow laws through the characters, including Al Harrison (played by Kevin Costner), Paul Stafford (Jim Parsons) and Vivian Mitchell (Kirsten Dunst). Harrison is the department head who is too busy to hate; his major goal is to beat Russia in the space race, and he isn’t going to let racism and sexism stand in the way of this goal. Stafford represents the old guard, undermining Johnson’s attempt at full participation by making it nearly impossible for her to do her job and then using her work and ideas for his own advancement. Mitchell is an agent of the state, citing rules and regulations as reasons for discriminating against Vaughan. Costner, who excels in his understated performance as the leader and moral compass of his group, literally tears down the “Colored Only” sign on the bathroom on the other side of the workplace after learning of the outlandish journey Johnson has to take to legally relieve herself. While the film does a decent job of capturing parts of the Jim Crow era and the challenges the women faced because of it, Hidden Figures relies heavily on Hollywood tropes to lighten the blow of white supremacy for audiences. The black characters are central to the narrative but removed from other parts of the larger systems of oppression. NASA is presented as an island where everything works out as it should, in contrast with the rest of the city and state, which were holding on to segregation for dear life. Audiences see glimpses of the social stresses of being black women in 1960s Virginia, but very little of the social unrest that plagued the state during that time period. Like the film The Help, Hidden Figures teeters on the edge of being so kitschy in its style and settings that it almost undermines the seriousness of what is actually taking place in the lives of these three dynamic women. Director Melfi manages to sidestep falling completely into the sanguine “Southern girls just want to have fun” character convention by showing that the women live full lives, including attending church, hosting gatherings at their homes and even enjoying courtship. Katherine Johnson meets and falls in love with Jim Johnson (Mahershala Ali), a dashing military officer who is as taken with her mind as he is with her beauty. Mary Jackson wins over her husband, who is initially skeptical about the value of earning another degree in a world where opportunities are limited for black people. Dorothy Vaughan encounters racism at the local library when she tries to expose her sons to books unavailable in the colored section. Melfi does just enough to remind viewers that Johnson, Vaughan and Jackson were fighting for more than just opportunity, equality and respect at NASA. They were also fighting for their rights and dignity out in the world. Hidden Figures is a solid film that aims to please with an all-star cast, strong performances, an infectious soundtrack and a score co-produced by superstar musician and Virginia native Pharrell Williams (who also serves as a producer on the film). This is a movie that lives up to the hype of the advertising and marketing while serving an important function of educating the masses and empowering young black women with dynamic images of themselves. And did I mention the superb clothing and costumes? What’s not to like? The previously untold story of three dynamic black women transgressing sociopolitical boundaries to help NASA transgress scientific boundaries is an important one that will have audiences cheering for years to come.